Face Masks ~ Lush 'Stuff'! I'm a sucker for a good face mask, and even more of a sucker for a Lush shop! Over a reasonable period of time i've been trying different Lush face masks with the intention of deciding which one will be my all time favourite. I just want to throw it out there, my skin type is mainly normal, and on the odd occasion it can get a tiny bit dry in areas - but not enough to call it anything different from normal. During early teenage years my skin used to be on the sensitive side, and over time (I guess using the suitable products and caring for my skin properly) my sensitivity improved and I can now use products that aren't harsh on sensitive skin. I think I'll start from my least favourite and work my way to the 'go-to' pick each time! Just as a disclaimer, although some of these didnt work well for my skin type, there is nothing to say its not effective on someone else's skin! I generally enjoy all Lush products! I liked the idea of this mask once having looked at the ingredients. Seaweed, ground almonds, aloe vera, rose absolute, and rosemary oil. Sadly, I felt quite disappointed in this one. (I do have a naughty habit of not putting these in the fridge, but I do keep them in a cold place.) I didn't particularly like the smell. I'm aware that fresh face masks aren't going to smell super sugary and sweet all the time, but this I didn't enjoy having it on my face. I only got to use this product once, so I do feel like its not necessarily had its fair trial, but what put me off of it was that when I went to use it for the second time, (the only way I can describe it) it looked like cobwebs had formed all over the product. That was unfortunately the end of that mask! This is packed with blueberries, the first thing that comes to mind is how good they are for your skin ~ they're full of beneficial vitamins and minerals! 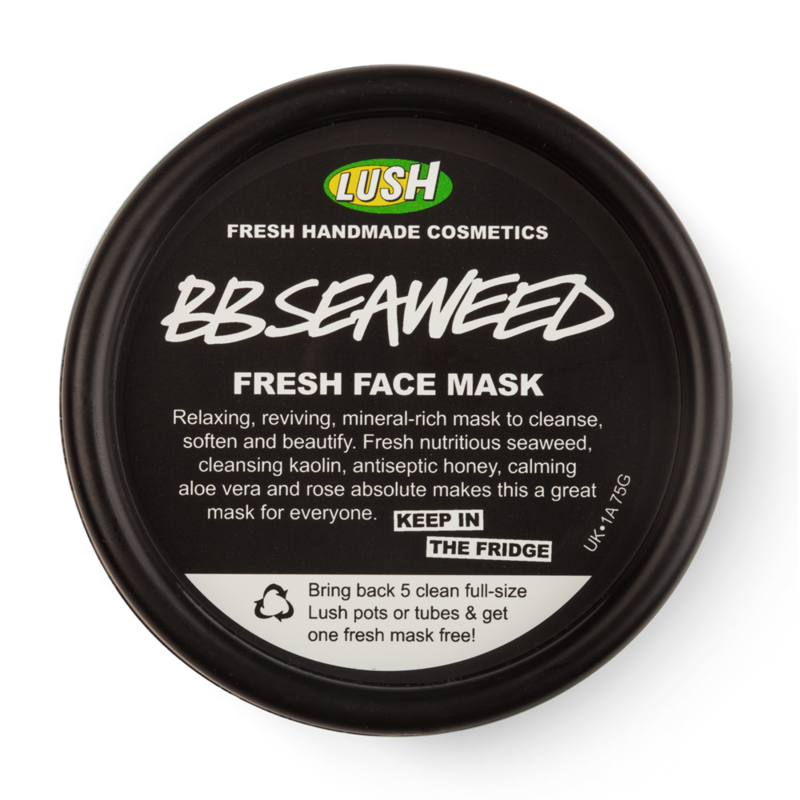 This mask feels so soothing to the skin, perfect for the end of a full make up day. I would happily use this mask again, the only (little!) thing that does bother me would be the chunks of blueberries that are in the sink and do not wash away easily down the sink. 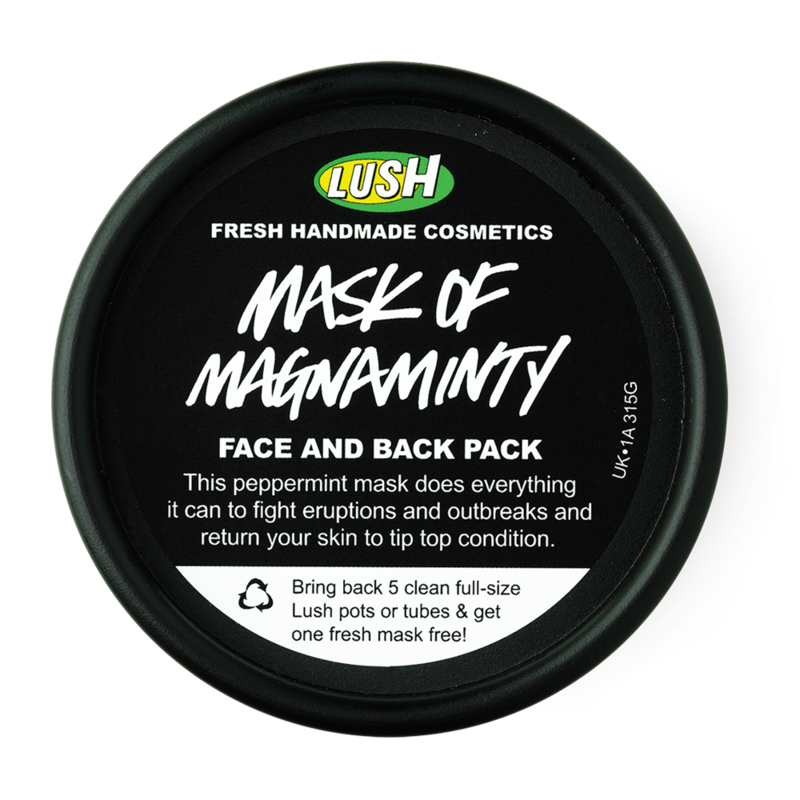 The Mask of Magnaminty was the first Lush face mask that I purchased. Packed with peppermint this mask is so soothing for troubled skin, and even clearer skin - I would recommend though for those facing spots etc! It smells so clean and fresh and leaves your skin feeling very clean when the face mask is washed off! Here you see Oatifix, my all time favourite! It feels so nourishing to the skin and smells so yummy! I really do believe that the bananas, oats, and almonds really do make a difference to your skin. 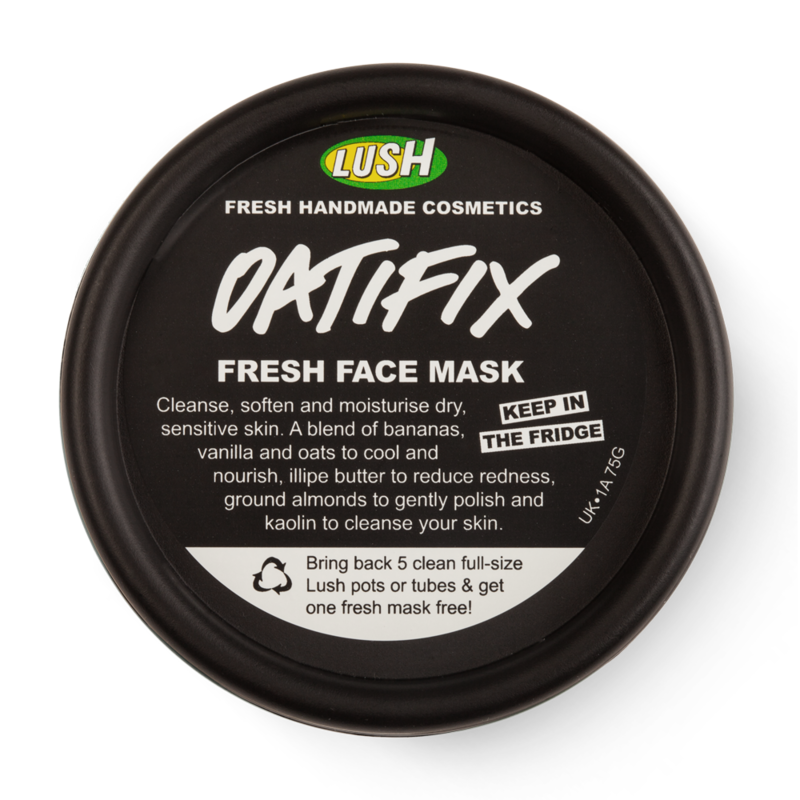 A lot of the Lush face masks can be very thick and a little harder to work around the face. I find that if you scoop out some of the mask and put it on the lid with (literally!) a drop or two of warm water, it loosens up the mask a little. I suppose it makes it go further because you're using less directly from the pot! If anyone is ever stuck for their next mask I recommend this one!! 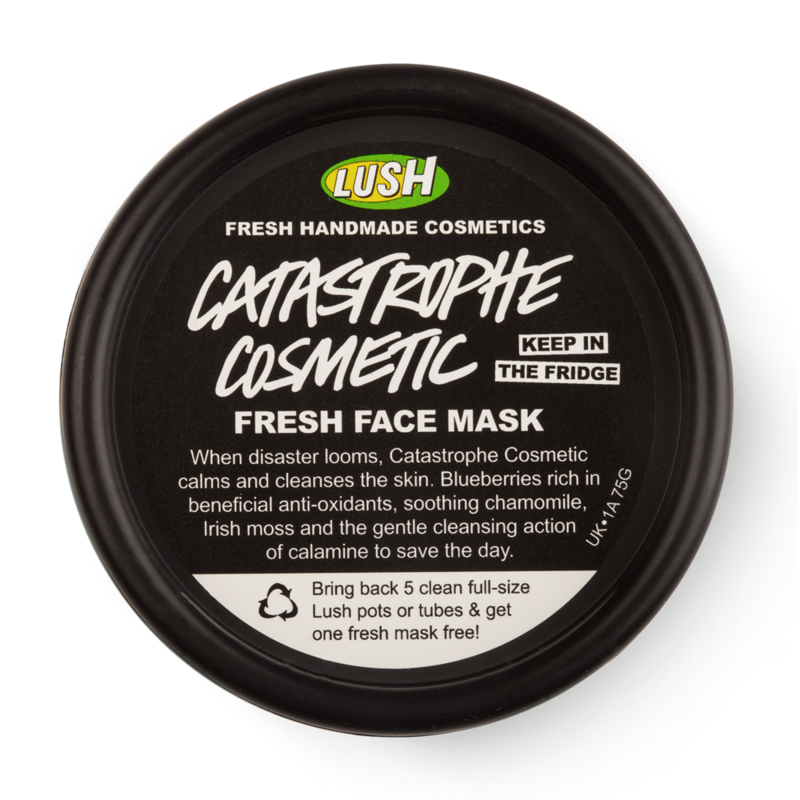 Lush have a much bigger range of face masks on their websites and in their stores. Why don't you take a look? Do you have a favourite that you think I should try? Let me know in the comments below! Your review is great and I love your blog! Thanks - I love Lush too! You're profile image is lovely by the way!